Derby and I are making it official. The lease is up and I'm completing the purchase this week. We're also renewing our committment to the Albion. I had a lesson last night, and rode in the old Barnsby that I have out on trial. 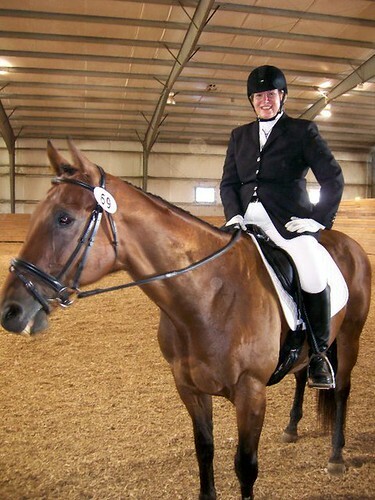 It is such a different feel than a dressage saddle. It’s wide, flat and open, and doesn’t restrict any movement. And it’s slick. No suede knee rolls. It’s old school. And it’s beautiful – I love old, well cared-for leather. It has a lovely patina. But it doesn’t work for me. I do some strange things in that saddle, specifically, I tended to push my feet out forward, to the extent I poked Derby’s elbow with a toe at one point. In some respects, the balance felt pretty good. But, as Christy noted, it wasn’t perfect. As we walked and loosened up, I stood in my stirrups to check my balance. I stood easily, and straight, and we walked halfway around the outdoor like that. This was a bit of a surprise. Last time I tried standing in the Albion, I teetered, I listed, I leaned. I could not stand. Clearly, the lessons are paying off – I felt pretty good in my saddle tonight. And Derby was nicely forward, no miserable, shuffle-y cow pony trot, and he had a nice swingy walk. We trotted around, over poles, did a little canter, then really covered some ground at the trot, and then called it a night on account of bugs. It was a nice ride, best I’ve had in a while. I’m glad I can give the Albion another chance. I do like that saddle, and so does Derby. 5 Responses to Love the one you’re with. For a second I thought that meant you weren’t going to be riding Derby anymore! Congrats! He sounds like such a perfect fit for you, a little saddle angst is nothing when you have the right horse! Sorry for the wrong impression, Annette! He’s a definite keeper! And I’m keeping him! Yay! It just made the statement that you’re writing a check for him make me smile even more. Such great news! I have a horse who is the perfect horse for me (ridiculously so… I can’t believe the progress he’s making despite my cluelessness!) and his former owner found the perfect horse for her with the money from him. It makes me just want to become evangelical about pushing people to find the right match! And I’m glad the Albion seems like it’s going to work out after all. Hooray! I’m glad you’re keeping him. I like you too together.